The dangers of DIY Teeth Whitening, is it worth it? You only have to walk into Boots or Superdrug in Wimbledon and see the plethora of over the counter (OTC) whitening products available to the aesthetically hungry public. The packaging the glossy pictures and the lure of saving hundreds of pounds compared to a professional whitening at a dental surgery makes these products really tempting to buy. Before you are tempted to go into Wimbledon Centre Court tomorrow, please consider the dangers of DIY teeth whitening with OTC products. Having a consultation with a dentist for whitening is not merely “yes you have yellow teeth we can charge you hundreds of pounds to whiten them”. We diagnose the cause of the discolouration thereby identifying the original problem and hence help you prevent relapse of the discolouration after you whiten your teeth. We also check for decay, internal resorption of teeth or hidden abscesses that may cause serious problems for you if you whiten the teeth without first dealing with these issues. In addition to that, some people have very difficult staining caused by medication such as tetracycline or have internal changes to their teeth that a short course of whitening simply will not shift. The whitening products cannot change or have any effect on crowns or big fillings at the front of the mouth and that is not immediately obvious on these OTC kits. Furthermore, a lot of these DIY kits are inherently dangerous because they do not have to comply with the same safety regulations your average toothpaste or mouthrinse as they are deemed cosmetic products. You may wonder why cosmetic product safety is not as stringent as oral healthcare products. Put simply, it is! However, in the context of where the cosmetic products are applied and that usually being on the outside of the body on the skin, cosmetic products do have several criteria for safety including not containing more than 0.1% hydrogen peroxide as per EU Council Cosmetic Directive 76/768/EEC. These dangerous OTC whitening products slip through the net by been deemed cosmetic products and generally do not contain hydrogen peroxide which is one of the main bleaching agents used to whiten teeth professionally. There are too many of these products to mention but it is worth knowing that most of these whether sold as a boil and bite tray application, whitening strip/wrap or brush application, contain a product called sodium chlorite. This product is usually packaged with a small amount of citric acid which is erosive and on contact with the teeth liberates chlorine dioxide which is a well-known whitening agent in the paper industry. Rapid initial whitening is seen but unfortunately the acid content basically dissolves the outer layer of the enamel of the tooth making the tooth weaker and it delays the natural re-hardening of the teeth on contact with saliva thereby making the tooth more susceptible to abrasion by tooth brushing in that time. Having researched many of these products during my PhD studies in Tooth Whitening and having heard many stories of problems from colleagues throughout the world, I am passionate about the dangers of these easily obtained products. Additionally, tooth sensitivity maybe a big problem when DIY whitening teeth as none of these OTC products have any desensitizing ingredients incorporated in them unlike the professional products used in dental surgeries. A distinction must be made for OTC products found around the world outside Europe which can be perfectly safe to use and are usually based on the 2 main bleaching agents Carbamide peroxide and Hydrogen peroxide. Another worrying trend which is hopefully dying out is that of beauty salons or other non-dental establishments offering to carryout whitening treatments which is even more dangerous as patients have been burnt and blistered because of these practices. This practice is not legal and after the General Dental Council prosecuted several individuals who were heavily fined, the problem is slowly disappearing. This article was written in response to a question from one of our patients at Merton Dental in Wimbledon who wanted to know the difference between what we do and what is available in the high street. 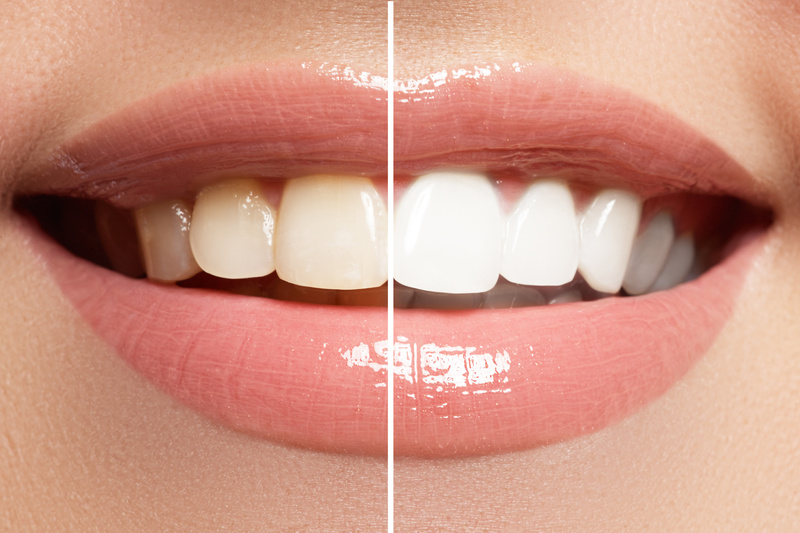 If this article has stimulated any interest in professional teeth whitening, please click on our treatment pages for more information and look out for our frequent special offers on whitening your teeth or simply call us on 0208 5441122 for more information.